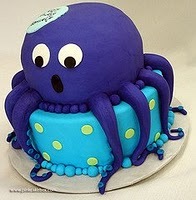 Cakespy: You mention that growing up, your mother was a great source of baking inspiration. What recipes or cakes were special in your childhood? Anne Heap: On Christmas Eve, we would always make a Bûche de Noël (a Yule log) . 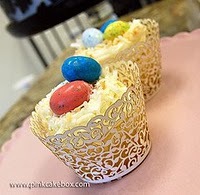 Our recipe consists of vanilla genoise, that is rolled as soon as it comes out of the oven in a cheese cloth. We then fill it with coffee whipped cream and frost it in dark chocolate frosting. My brother and I would fight over making (and eating) the marzipan mushrooms! CS: You left a job in advertising to pursue your dream of baking. CS: How did this decision come about? AH: While working in advertising, I started selling cookies and brownies to a local gourmet shop. They sold really well - so I decided to sign up for an amateur class at the French Culinary Institute. When I went for a tour, I fell in love, signed up for the professional pastry arts program....and quit my job the next week! It was definitely a leap - but I'm so happy that I did! CS: Is Pink Cake box open to the public, or by appointment only? AH: We're by appointment only. Customers come in for tastings and consultations. CS: How is running a cake business different than you might have expected? AH: I imagined it wouldn't be easy...but I never dreamed that I would work 100 hour weeks as often as I do! There is so much work to do in a day that doesn't even involve cake - like bookkeeping, advertising, etc. I also never expected to have quite as much fun as I do have. Every customer brings something new to the table, which keeps our creativity running high. CS: How has running a cake business changed how you look at cake? AH: I don't look at it as dessert anymore - that's for sure! It's much more than that....a centerpiece, a sculpture...a piece of art. 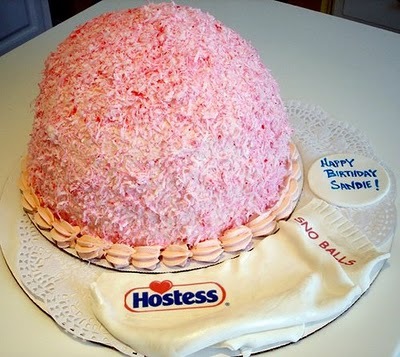 CS: Other than cake, what other types of goodies do you make at Pink Cake Box? AH: Cupcakes, wedding cupcake stands and cookies mostly. Every once in a awhile a bride will convince us to make truffles or other chocolates for favors. CS: You've done some pretty unusual themes--like the "Rescue me" wedding cake (photo left) we read about on your blog recently. 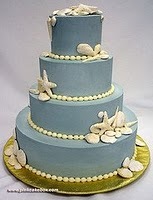 Is this a trend--brides feeling more freedom to have a more "fun" cake? AH: We're noticing a lot more stories being told with cake. One couple had us add a paw print to the side of their wedding cake because they met walking their dogs. Another couple asked us to create a Scrabble themed wedding cake because they played it online with each other while the groom was stationed in Iraq. 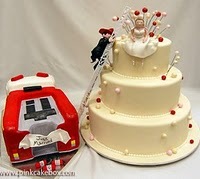 It's very fun for to get to know the couple and then make a cake that really reflects who they are. CS: What are your most popular flavors these days? AH: Red velvet with lemon cream cheese filling, chocolate fudge cake with raspberry chambord filling and vanilla cake with hazelnut frangelico are three of our most popular flavors for weddings. Chocolate with oreos and cream or peanut butter fillings are really popular as well. AH: The most basic and yet integral part is baking a good cake. It's so important that the cake and filling taste delicious - so our recipe development is crucial. Using quality products like Vermont butter and Belgian chocolate is also important. CS: Here's something we've always wondered: is your "cake" handwriting when you letter a cake different than your regular handwriting (on paper etc)? AH: My cake handwriting is the same as my regular handwriting...when I'm trying to write neatly :) When I'm writing quickly - I can' t even read my own writing sometimes! CS: Is cake ruined for you as a dessert since you make it so often? Or do you still enjoy eating it? AH: No it is definitely not ruined. My favorite is red velvet - so I take a little nibble quite often! CS: What is your favorite type of dessert? AH: Cookies. Warm and gooey right out of the oven. Especially chocolate chip. CS: Has there ever been a dessert that you tried to make but couldn't get right? What type? CS: Be honest. If you had to choose between pie and cake, and could only eat one or the other for the rest of your life, which would it be? CS: Any advice for those wanting to pursue their own dreams and start a cake business? AH: I'd recommend getting an internship or job at a cake shop to see the daily ongoings and what life is like owning a cake business. After that, I'd suggest doing some cakes for friends and family to get started. You can read my post on How to Get Started in a Baking Career for more info. CS: What is next for Pink Cake Box? AH: That's a great question! If only I knew! We'd like to start some decorating classes.....and possibly branch into retail. We'll keep you posted! 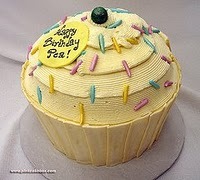 Cakespy: You started at Pink Cake Box fairly recently. What is your job description and responsibilities? Christine Lindstrom: At first I started out as an intern over the summer, which involved tasks that one would imagine an intern would do - I did dishes, I cut up the fifty pound block of butter, and learned the basic recipes.. etc. As time went on, having a background in fine art, I started to help decorating. I'm only at Pink Cake Box part time right now while I'm finishing my undergraduate degree in fine art at Monmouth University, so I'm mostly there on weekends. There are always so many random things to get done when I'm there, so I suppose I don't have my own set of responsibilities, but I do get to show off my artistic skill pretty often. It is definitely always a team effort though. When I'm there we're either putting the finishing touches on cakes, cupcakes or cookies before they get shipped out, or starting to make sugar pieces to go on orders for the weeks ahead. It can get pretty crazy! CS: Have you always had an interest in culinary arts? CS: How is working at a commercial bakery different than you might have expected? Or, is there anything about it that might surprise us? CL: I guess at first I was nervous about commercial kitchen etiquette and I was always afraid I was going to spill something or not measure things correctly, but as time has gone on, I've taken on the habits of the professionals. I never knew how precisely things have to be measured and just how clean everything must be kept. It's not really much different than baking at home, but I have noticed that I've turned into such a clean freak even in my own kitchen and my art studio! Besides the obvious need for cleanliness with food, I've realized that a neat work space makes your mind feel so much better. Something that did surprise me when I started working there was the weighing of even the cupcake batter! Every single cupcake is the exact same size!! CS: What is the best part of working at a cake bakery? CL: The best part for me is knowing that I get to be a piece of the happy events in people's lives. It is such a fulfilling feeling to know that they will always remember the things we make for them. My own parents still remember their wedding cake after 26 years of marriage! (Ironically enough, their cake was the wrong flavor! This job was my destiny before I was even a thought in their heads). Cakespy Note: Clearly! CS: Would you say that you eat cake more, or less, now that you work there? CL: Oh my gosh. Cake has become one of the major food groups! I didn't even used to LIKE cake. I would just make desserts to show off my creative side. But now that I work at Pink Cake Box, I really can't live a week without it. Our cake is just so darn good that I seriously can't resist!! 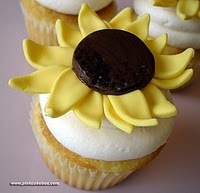 I have a cupcake next to me as I type this. There will need to be an intervention after I graduate and I'm there more often! CS: What was one of the most fun jobs you've worked on at Pink Cake Box? CL: There are always a lot of fun things for me to do. I think my favorite job was when I made a sugar sculpture of someone's dog for a groom's cake. Anne is always really great about letting me be free to interpret what customers request. We understand each other very well and it's great working for someone who is creative too. This particular cake was a replica of a train and the couple wanted their dog to be incorporated in some way. I had a picture of their dog, Rupert, Anne and I discussed how big he should be and off I went. I just remember feeling like I was making art with different materials. It's assignments like that that make me feel like I'm really a sugar artist. CS: What, to you, is the coolest part of cake making? aren't as complicated as they seem once you simplify it all down into planned out steps. I think it's really neat that all the chaos - of the cake itself, the height, the colors and designs - get summed up into a nice little package at the end of the day. It's all about cake philosophy - seeing cake differently! CS: What are you doing when you're not decorating and making cakes? CL: I absolutely love tiramisu lately. Truffles rank up there as a lovely little after dinner, dessert-like item too, (I love the exotic flavored ones most of all). My tastes change quite often because I live for trying new things. Life is too short! I want to try it all! CS: What is your least favorite dessert? CS: Red Velvet and Carrot cake are facing off in a barroom brawl. Who's gonna win? CL: Red Velvet hands DOWN! Vegetables are not as good as massive amounts of food coloring! Haha but seriously, if anyone hasn't tried red velvet cake, it is truly amazing. The subtle chocolatey goodness is magical. CS: What are some of your ultimate baking dreams or goals? CL: Being fresh to the baking scene, I think I will probably stick around to watch and help Pink Cake Box grow... as long as I don't become a famous painter anytime soon ; ) So, as corny as this will sound, Anne's dreams are my dreams. She's doing a way better job then I could probably ever do! She is my Yoda. CS: But more immediately...what are you hoping for in your easter basket? CL: I wait for my Jelly Belly's all year!! Are you in the Denville area? Lucky you! 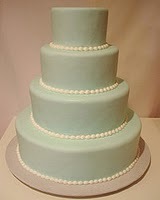 Why not seek out your next special occasion cake at their studio (by appointment only please)? 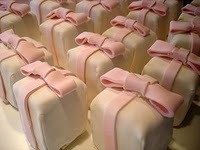 Pink Cake Box, 18 E. Main St., Ste 101, Denville; online at pinkcakebox.com. Not in the NJ area? 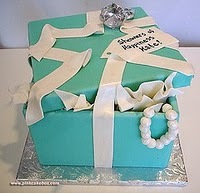 Well, make like these Cake Gumshoes and keep updated via their blog and beautiful photos on Flickr.